I’m still out of breath. I usually have a couple of days to think about a book before I write the review. Due to time constraints this week, however, I didn’t have that luxury and had to finish this one up quickly. 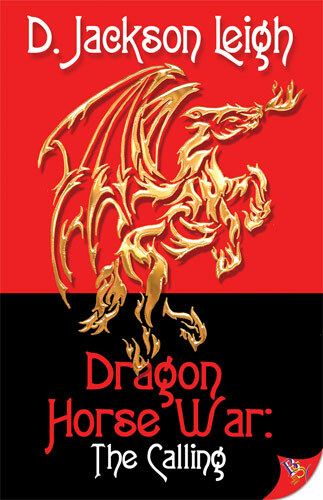 Luckily, Dragon Horse War: The Calling is so compelling that I zipped through the last forty or so pages with some time to spare. And I don’t have to think too hard to find praiseworthy elements in D. Jackson Leigh’s first fantasy. Already an accomplished author of many romances, Leigh takes on fantasy and comes up aces. The Collective, a small governing body, has ruled Earth peacefully for many years, but this time of peace is threatened by an upstart group called The Natural Order and their leader, Cyrus (aka The Prophet), who wishes to supplant The Collective with a religious hierarchy that smacks of evangelical hatred. This threat prompts a Calling from The Collective, bringing First Warrior Jael into the picture. She and her newfound love, First Advocate Alyssa must raise an army of dragon horse warriors to defeat The Natural Order and restore harmony. Can they defeat Cyrus and his followers? Or will the sheer magnitude of their task be too much for them? Savvy storyteller that she is, Leigh understands that good world-building rests on the cornerstone of character, and she sets up three dandies in Jael, Alyssa, and Cyrus. She does a terrific job of highlighting Jael’s weaknesses as well as her strengths, and turns the First Warrior into an altogether human character who hates the job she must do. Rather than just provide support, Alyssa comes in to her own as a fully-realized character as well. But Leigh’s neatest trick may have been showing the big bad guy, Cyrus, as twisted because of the loss of his family (which we see right up front) rather than some inherent malevolence, making his fall from grace particularly poignant. I’ve admired Leigh’s prose since her Goldie-winning Every Second Counts, but romances don’t usually come with battle scenes or action sequences, so I approached the first one (trainee warriors bonding with their dragon horses–a particularly tricky process that sometimes ends up in incineration) with some trepidation. I needn’t have worried. It was well-paced, perfectly timed, and even featured a tremendous toasting of a trainee that allows Jael some great character moments at the funeral pyre. And the climax where the warriors take on The Natural Order is even more breathless. Go, D Jackson Leigh! I can’t wait to read it!